Driving the low and light Subaru BRZ is truly blissful. Predictable steering, great balance. But for the years the car’s been out, we’ve been hearing the same chief complaint from enthusiasts across the board: where are the birds? The eBird app, which I was curious enough to downloaded on my phone (you have to make an account, ugh) apparently draws off a massive database of bird sightings to tell you what birds are where. Then you can record your own findings if you’re a big bird nerd. Actually, it’s pretty cute! And so are birds. And so is the Subaru BRZ’s 2.0-liter engine, which still coughs up a dainty 205 horsepower—the thing everybody actually complains about. Not the inability to find birds. Did you get that? But 205 HP out of 2.0-liters is actually pretty impressive, guys. 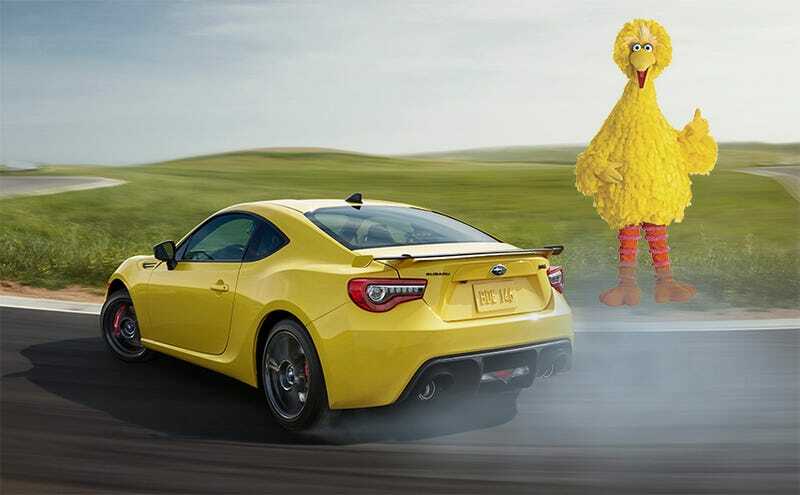 But the performance car community has been begging for more juice in the BRZ and its sister the Scion FR-S/Toyota 86 since the car was new. Couldn’t somebody please make a mass-market OEM turbo upgrade for this little guy? Some are still holding out for a big boosty BRZ STI, but I wouldn’t hold your breath. For now Subaru just wants you to know that seven other non-bird related apps will also be available in their cars: a Magellan cloud-driven navigation system, a parking spot finder, a share-your-location app, a driving habits tracking app, a car owner’s manual app, a local events app and Yelp.